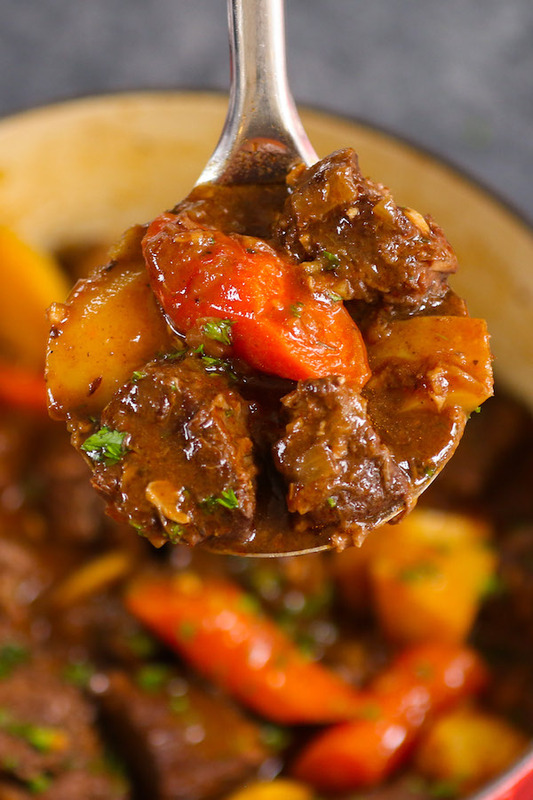 This simple Beef Stew is hearty and satisfying comfort food with tender, melt-in-your-mouth beef simmered in a rich and divine sauce with carrots, onions, and potatoes. Your family and friends will ask for this Crock Pot Beef Stew again and again! This Beef Stew is easy to make and full of flavor. I make it year-round for the entire family, and my home is filled with the fantastic aroma as it cooks. You can confidently serve it for a dinner party or potluck as a mouthwatering make-ahead meal! Beef stew is one of my favorite beef recipes along with Mongolian Beef, Pan-Seared Sirloin Steak, Garlic Beef Lo Mein, and Philly Cheesesteak Sloppy Joes. If you want a crock pot version, try my Slow Cooker Beef Stew. The most important thing for beef stew is to buy the right cut, and it’s surprising that cuts that start out tender like strip loin become tough and chewy in a stew! What you want instead are big and tough cuts like chuck roast, which comes from the shoulder and has great flavor. The collagen in its connective tissue breaks down during cooking, leaving you with fork-tender beef. Other cuts that are good for beef stew include bottom round roast, chuck steak, bottom eye roast, chuck-eye roast, English roast or pot roast. Make sure to avoid packaged “stew meat” at the supermarket. The pre-cut “stew meat” consists of leftovers that do not cook consistently and usually become chewy. If your chuck roast is well-marbled, you can trim any excess fat. Cut the beef into large 2-inch cubes, as small pieces tend to fall apart during cooking. Consider getting your butcher to do the trimming and cutting for you to save time! Pat the beef dry and cut into 2-inch cubes, and then place a 5-quart ovenproof pot on medium-high heat. When hot, add 1 tablespoon of oil followed by enough beef to make a single layer without overcrowding to get a good sear. Allow the beef pieces to brown for 2 minutes. Turn the pieces using kitchen tongs and brown the other side for 2 minutes more. Remove the beef to a plate, and repeat. Note: It’s important not to over-crowd your pan and cook your beef in a single layer. Add more oil for each batch. This step takes some time but it adds so much flavor to your stew. However, you could skip this step if you are in a rush. Add the onion and garlic to the pan to the pot and saute for 3-4 minutes with a wooden spoon, scraping the browned bits off the bottom of the pot. Then add the red wine, broth, tomato paste, balsamic, bay leaf and flour. Stir to combine. Cover the pot and place in the lower half of a 325°F oven to braise for 2 hours. By this time, the beef should be close to fork-tender and the sauce thickened slightly. Note: the stew will thicken further as it cools. Remove the pot from the oven and add the carrots and potatoes. Then return to the oven for 30 minutes more. Now it’s ready to serve. Garnish with minced fresh parsley if you like and enjoy! Beef: Use chuck roast or a similar cut as explained above. Avoid packages of “stewing meat” from the supermarket. 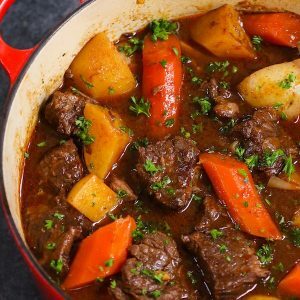 Wine: You don’t need a fancy wine to make beef stew! 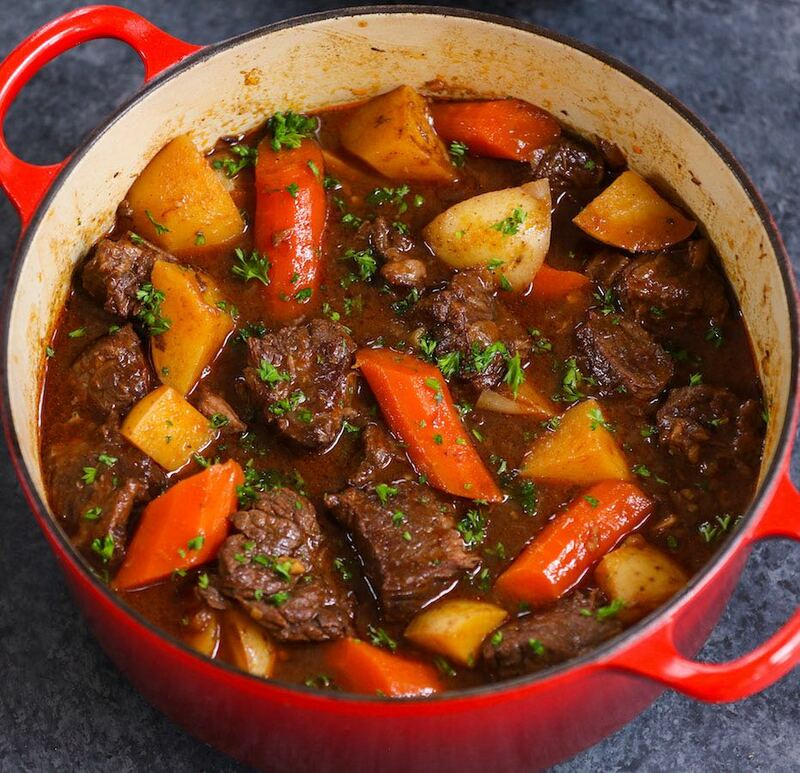 An inexpensive full-bodied wine like a Cabernet, Zinfandel, Merlot or Bordeaux will often be excellent for stew, with the acidity tenderizing the meat and the flavor mellowing as it cooks. Beef broth: I recommend using a low-sodium beef broth, so you can easily control the saltiness of the stew. 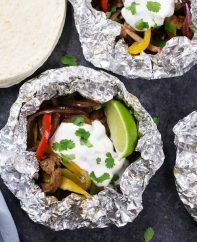 Potatoes: I prefer using baby Yukon potatoes for beef stew, as they can withstand hours of slow cooking while retaining their shape and texture. Avoid large red, yellow or salad potatoes, which can become mushy when cooked for a long time. Kitchen tongs are essential for turning the beef pieces easily in the pan. A wooden spoon is helpful to stirring the stew and scraping the browned bits off the bottom of the pot. If your oven is unreliable at all, use an oven thermometer to check the temperature is correct before the 2-hour braise. 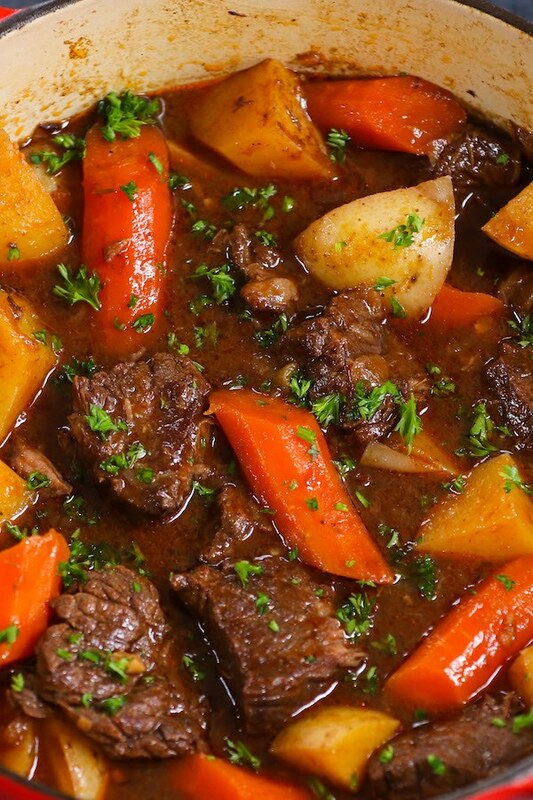 Beef stew is easy to make ahead of time and the flavor actually improves the next day. Reheat beef stew over medium heat using the same Dutch oven or a saucepan. To store beef stew: Let the beef stew cool to room temperature before placing it in an airtight container. 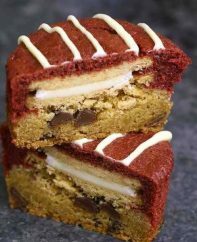 It can last up to 4 days when stored in the fridge. 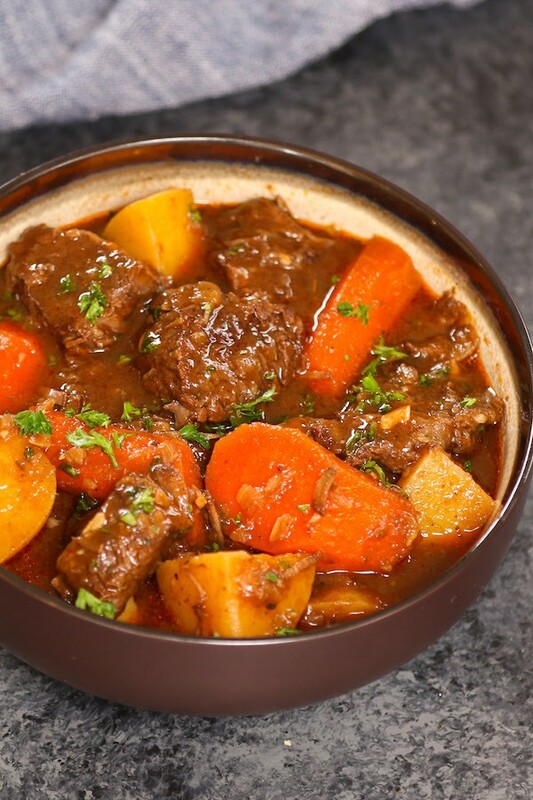 To freeze beef stew: Place the beef stew in an airtight container or ziptop bag, and it will freeze well for up to 3 months. Beef Stew is one of the best hearty and comfort food to make in a crock pot. Tender and melt-in-your-mouth beef is simmered in a rich and divine sauce with carrots, onions, and potatoes. Your family and friends will ask for this Crock Pot Beef Stew again and again! 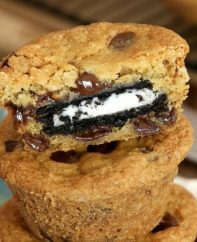 Plus recipe video tutorial! Preheat oven to 325°F. Set aside a 5-7 quart heavy ovenproof pot. Pat dry the beef with paper towels, and cut into 2-inch cubes. Place pot over medium-high heat. When hot, add 1 tbsp olive oil and enough beef to fit in a single layer with some space in between. Let the meat brown for 2 minutes, then turn the pieces to brown for another 2 minutes. Remove to a plate, and repeat with remaining oil and beef. Add the onions and garlic to the pan and sauté for 3 minutes using a wooden spoon and scraping the browned bits from the bottom of the pan. Add the browned beef, red wine, broth, tomato paste, balsamic vinegar, flour, thyme, bay leaf, salt and pepper. Stir to combine. Cover and place in the middle of the preheated oven to braise for 2 hours until the meat is tender and the sauce thickened. Remove the pot from the oven and add the potatoes and carrots. Return to the oven for 30 minutes more. You may need to reduce the amount of salt if using salted beef broth. This is the Best Beef Stew ever !!!!!! I don’t know why you’ve only gotten 1 review, because I think it’s an excellent recipe. I’ve made beef stew for years but I think your recipe kicked it up a notch – I’ve always added red wine but the red wine vinegar added something special. Any cook, especially beginners can benefit from the extra tips you gave. I’ve never written a review, but felt this deserved one. Excellent stew!